This month’s newsletter contains a report from recent events held in Ishikawa Prefecture, Japan, including an International Forum on Biocultural Diversity and the Twelfth Meeting of the IPSI Steering Committee, which welcomed 10 new members and endorsed 6 new collaborative activities. We are also passing on a Call for Input from IPBES for the Global Sustainable Development Report, and we are happy to report the recipients of the 2017 round of the Satoyama Development Mechanism (SDM). Finally, we would like to introduce readers to one of IPSI’s newest members, Observer Ecological Consultant, Co., Ltd., based in Chinese Taipei. 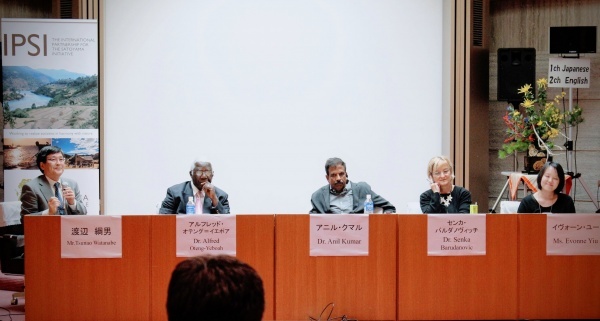 The first in a planned series of international forums to commemorate the one-year anniversary of the 1st Asian Conference on Biocultural Diversity was held on 4 October 2017 in Kanazawa, Ishikawa Prefecture, Japan, titled “Biocultural diversity & satoyama: Efforts towards societies in harmony with nature around the world”. The forum was organized by the IPSI Secretariat and the Operating Unit Ishikawa/Kanazawa (OUIK) at UNU-IAS, along with the Ishikawa Prefecture and Kanazawa City governments, and the Hokkoku Shimbun newspaper. It was also held back-to-back with the Twelfth Meeting of the IPSI Steering Committee (SC-12), and a number of additional events were also organized to give IPSI’s Steering Committee members and local experts opportunities to exchange knowledge on SEPLS including Japan’s satoyama and satoumilandscapes and seascapes. The Forum featured keynote speeches by Prof. Takakazu Yumoto of Kyoto University and IPSI Steering Committee Chair Prof. Alfred Oteng-Yeboah of the Ghana National Biodiversity Committee. SEPLS case studies from India and Eastern Europe were then given by Steering Committee members Dr. Anil Kumar and Dr. Senka Barudanovic, and a panel followed with all of the above experts as well as Ms. Evonne Yiu and moderated by Mr. Tsunao Watanabe, both from UNU-IAS OUIK. The organizers also provided the Steering Committee with a lecture on biocultural diversity in the area by Prof. Koji Nakamura of Kanazawa University, and an excursion to a number of satoyamaand satoumi sites on the Noto Peninsula, as well as a welcome reception hosted by Ishikawa Prefecture. The IPSI Secretariat would like to thank our colleagues and friends at all of the co-organizers, as well as all of the IPSI Steering Committee members who made the events a great success. IPSI Collaborative Activities are activities carried out by at least two IPSI members (possibly in collaboration with other organizations), and approved as such by the IPSI Steering Committee. At its its meeting this month, the IPSI Steering Committee approved the proposals for 6 new IPSI Collaborative Activities, bringing the total number of IPSI Collaborative Activities to 46. The IPSI Secretariat recently heard from our colleagues at the Secretariat of the Intergovernmental Platform on Biodiversity and Ecosystem Services (IPBES) that inputs are sought “from the widest-possible group of scientific and non-scientific communities” to the “Global Sustainable Development Report (GSDR)”, a major quadrennial publication to assess the state of sustainable development.The next edition of the GSDR is scheduled for publication in 2019 and will inform the High Level Political Forum for Sustainable Development (HLPF), the major body overseeing the Sustainable Development Goals (SDGs). IPSI members are highly encouraged to consider contributing to this call for input. The deadline for contributions is 1 December 2017. For more information, and to access the call for input, please go to https://goo.gl/BHdL3b. In 2013, the Institute for Global Environmental Strategies (IGES), the Ministry of the Environment of Japan (MOEJ), and the United Nations University Institute for the Advanced Study of Sustainability (UNU-IAS) jointly launched the “Satoyama Development Mechanism (SDM)” as a collaborative activity under the framework of IPSI to facilitate further implementation of IPSI activities by providing seed funding to promising project proposals.The SDM Executive Board recently announced the six recipients of grants offered for the 2017 round. We are sure we join all of IPSI’s members in welcoming this new member to the IPSi family. For more information, please see their website here.